Russian historian; born at St. Petersburg; died at Heidelberg 1900. The son of a book-dealer, he early developed a passion for reading historical works. After coṃpleting a course of study at the gymnasium of his native city, he entered the University of Leipsic, where he devoted himself to the study of history, especially of Polish and Lithuanian affairs. Among his works the following may be mentioned: "Senatorowie i Dignitarze Wielkiego Ksiestwa Litewskiego, 1386-1795" (Cracow, 1885); "Syd Ministrem Króla Zygmunta" (ib. 1885), a historical sketch; "Ród Gedymina" (ib. 1886); and "Kniziowie Litewsko-Rusey od Końca xiv w." (Warsaw, 1895). 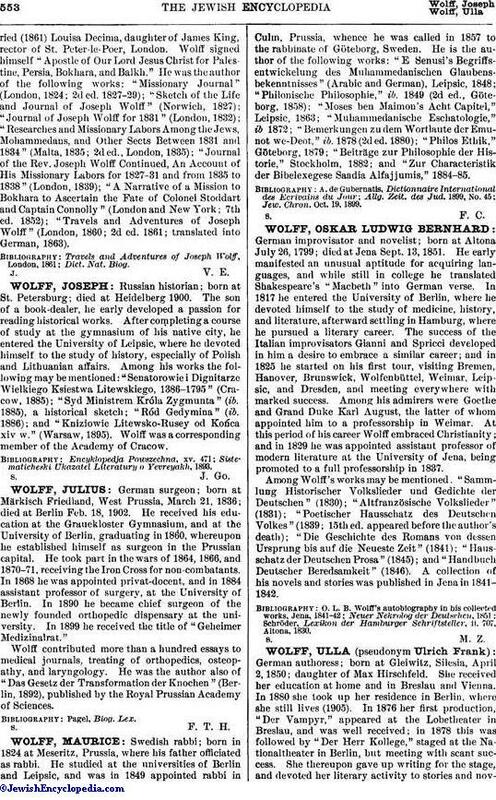 Wolff was a corresponding member of the Academy of Cracow. Sistematicheski Ukazatel Literatury o Yevreyakh, 1893.